This second volume of the Capital Markets Forum Yearbook aims to provide a platform for debate and comment on key issues affecting the world's capital markets. It will have a broad appeal for regulators, law makers, investment and merchant bankers, corporations and legal practitioners alike. a Literature section containing a bibliography and book reviews. Appropriate source materials and a subject index ensure that the Yearbook remains a highly accessible source of information. 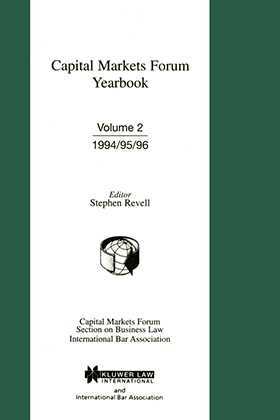 In addition to covering capital market issues generally, the Yearbook also provides useful information on developments in the securities world, drawing on the work of the IBA's Section on Business Law Committee on Issues and Trading in Securities and the Committee on Taxes. The book presents a detailed overview and analysis of important trends worldwide, particularly highlighting developments of more widespread interest. The editor is a leading capital markets practitioner and he has ensured the Yearbook contains articles and commentary of real practical, yet thought-provoking value.